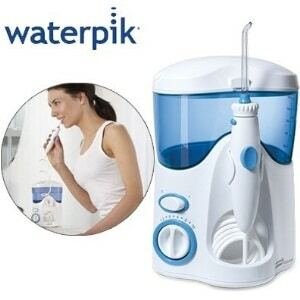 In the world of oral hygiene, there is the Waterpik brand of water flossers. They have dominated the market with award-winning flossers that have incredible technology. Water flossers beat string flossing, and many dentists recommend it for all their patients. While they recommend flossing, you’ll want to pick the one that fits with your requirements. That will be based on who is using the flosser. You’ll need to ask yourself questions about who will use the flosser. You’ll need to think about whether you want a flosser and toothbrush combination, too. Color, style, attachments, and reservoir space are all the things you’ll need to figure out before you make your purchase. We’ll help you make a choice by breaking down the options and making comparisons. 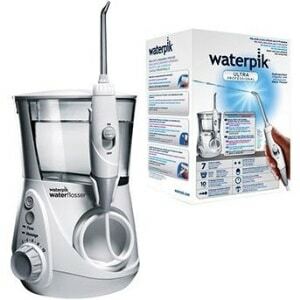 The WP-100 is one of the first water flossers made by Waterpik. It comes with 2 classic tips that blast away plaque below the gum line. With its 10 pressure settings, there’s a power for everyone. Even if you are a beginner to the whole water flossing experience, you can start at a low speed. The settings range from 10 PSI to 90 PSI. Along with the 2 Classic tips, it comes with 4 others. There’s a tip for everyone in the family and every type of dental issue you want to address. It comes with the Orthodontic tip, Plaque tip, Pik Pocket tip, and Toothbrush tip. There’s a covered area in the reservoir to store all the tips. Dentists recommend that their patients brush and floss for approximately 2 minutes after meals, in the morning, and at night. String floss doesn’t have the same kind of results as water flossing. It’s known to remove up to 99% of the plaque between teeth and near the gum line. 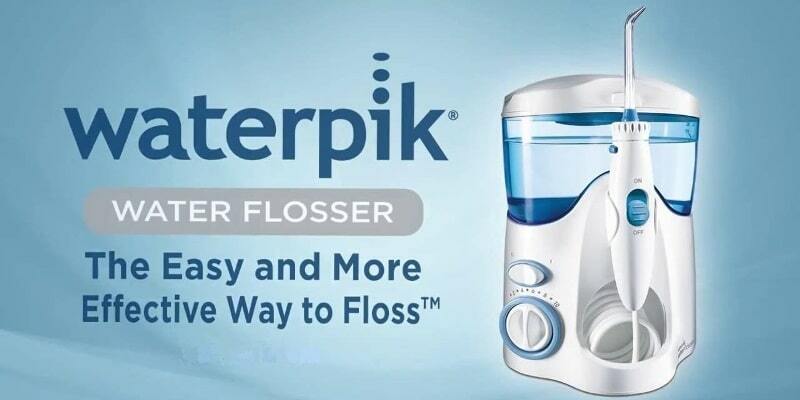 The Waterpik Water Flosser has over 90 seconds of water capacity, which means you’ll definitely meet the dentist’s recommendation for how long to floss. I’d recommend the WP-100 for those who are new to water flossing. It’s great for a child’s bathroom and will get them on the road to great oral hygiene habits. The reservoir is over 90 seconds of water, so it won't need to be refilled. There are 10 pressure settings for personalized flossing. It includes 6 tips for various dental concerns. Can be quite strong for sensitive gums even at a lower setting. The WP-660 is “First in Category” with an awarded Seal of Acceptance from the American Dental Association. The ADA Seal is the ultimate in awards for oral hygiene. The Aquarius has 10 pressure settings. It also has the ability to pause water flow at the handle. While you're flossing, you can control water without it splashing everywhere. The handle can also turn, so you'll be able to get the hard-to-reach areas like the back of the mouth. There's a timer on this flosser to help you floss for longer and get a cleaner mouth. The pacer will keep you on target and make sure you get to every part of your mouth equally. There are two water flossing modes, so you'll be able to floss as well as massage your gums. This improves circulation to the gums and makes them healthier. In two weeks, your gums will be healthier, and you can actually reverse the start of gum disease. The Aquarius comes with its own flosser tips. There's a classic tip for each member of the family. It comes with three of them. There's also the Plaque Seeker, the Orthodontic, the Pik Pocket, and the Toothbrush tip. They can all be easily stored in the storage area of the water flosser. This is a recommended flosser for all the members of your family. It's especially good for those who are plagued with the start of gum problems. The Aquarius comes with 7 tips for your oral hygiene needs. Its tip rotates 360 degrees. There's a timer and pacer with this flosser. Included is a LED function indicator. A 90+ second water reservoir is available for complete flossing. Some found this unit to be very loud in the quiet confines of their bathroom. The designer series 670 has beautiful accents of satin chrome and are available in a few colors. There's a sleek black as well as a lovely blue. Purple, pink, and teal might appeal to everyone in the family, too. It still has the same great features of the Aquarius 660, which includes pulse modulation for massaging your gums. It also has a floss mode for plaque removal. There's a one-minute timer to ensure that you're using this for long enough to see its full benefits. The 30-second pacer is a great feature included with this flosser, too. It'll ensure that you spend an equal amount of time on both sides of your mouth. There are 7 tips included with the WP-670. Three Classic tips are included, so everyone in the family can enjoy a clean mouth with this flosser. There are more tips like the Toothbrush, Orthodontic, Plaque Seeker, and Pik Pocket tip. As far as the pressure settings and water capacity, the Aquarius WP-670 has a huge reservoir that will hold over 90 seconds of water. The cover of the reservoir will hold more tips, too. The settings include 10 pressure levels from 10 to 100 PSI. You can start with a low 10 PSI as a beginner and increase the pressure as you become accustomed to the speed of the water. I'd recommend this for anyone who wants to coordinate and have fun with their water flosser. It's terrific for teenagers who might be upset about having to wear braces. They'll be able to enjoy the fun colors of the flosser in their bathroom. Variety of lovely colors for the 670. Over 90 seconds of reservoir capacity. There are 7 tips included with this flosser. It has 10 pressure settings from 10 to 100 PSI for tough plaque buildup. Body and tray have to be locked tight to ensure that it doesn't leak. Requires care to ensure that it meets properly. If you're looking to improve your teeth and gums after a disappointing dental visit, this is a flosser and sonic toothbrush in one device. It'll save on counter space as well as saving on money. When you have one device, you're saving time, too. Once you've filled the 90+ second reservoir, it's easy to brush and floss quickly. The Sensonic toothbrush comes with two toothbrush heads, so you can share this with your significant other. There's a 2-minute timer and 30-second pacer to ensure that you're brushing well. It'll ensure that you're brushing for the required 30 seconds in each quadrant of your mouth. The toothbrush has two speeds and is controlled by a button on the handle. It can be taken on the road with the travel case, too. On the flosser, you'll find an incredible amount of features. There are 5 tips included with the water flosser. Any type of oral care issue you have can be addressed with a flosser tip. There are 2 Classic tips, a Plaque Seeker, Orthodontic, and Pik Pocket tip. The handle of the flosser has a pause button, so you can stop the flow of water without taking the flosser from your mouth. The tip rotates to get the back of the mouth, too. Next to the reservoir, you can keep extra tips and brush heads. The storage compartment actually keeps the tips sanitary and free of dust. That's important for having a sanitary oral care system. Large reservoir for over 90 seconds of cleaning. 2-in-1 oral care system with flosser and sonic toothbrush. Includes 5 flosser tips and 2 toothbrush heads. Toothbrush only has two settings; low and high. There's no happy medium for the toothbrush part. When you have a combination of sonic toothbrush and water flosser, you're definitely taking your oral health seriously. You can remove more plaque with a water flosser than you can with string floss. A sonic toothbrush will leave you with a cleaner mouth compared to manual brushing. The company is sure about its superiority to other flossers and toothbrushes. They provide a refund to anyone who isn't seeing a clear improvement in just 14 days. Included with the flosser are 5 tips. There are 2 Classic tips, an Orthodontic, Pik Pocket, and Plaque Seeker tip. There are also 4 brush heads included for the sonic toothbrush. It comes with 2 compact brush heads for hard-to-reach back areas of the mouth. These brush heads are perfect for a child's mouth, too. There are also 2 standard brush heads. Between the tips and brush heads, there's a sanitary choice for everyone in the family. The reservoir is large enough to provide 90 seconds of flossing before or after you brush with the sonic toothbrush. There are 10 pressure settings as well as buttons on the handles for personalized settings. The flosser has water control right on the handle. The toothbrush has 2 speeds that can be changed right from the handle itself. This is a beautiful flosser and sonic toothbrush system that will look great on your counter. It has chrome accents and comes in black or white. This flosser and toothbrush is recommended for the whole family. It has plenty of tips and brushes for everyone. Complete oral care system with toothbrush and water flosser.. It comes in 2 styles with chrome accents. Remove plaque and bacteria from between teeth and below the gum line. 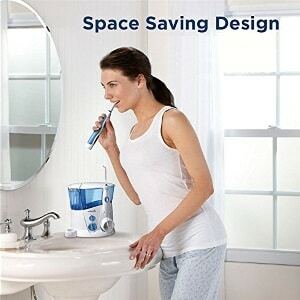 Space-saving unit replaces flosser and toothbrush. It needs only one outlet. Comes with tips and brush heads. There's a small gap between the handle and the brush head that is meant to be there. It can be confusing for new owners. First, let's discuss the great things about the WP-100. It's an older model that is reasonably priced. This makes it a great starter flosser for anyone who needs to up their oral hygiene game. If you've had a bad visit at the dentist, this is a good way to remove all the plaque and debris that causes problems. It'll stop you from spending a ton of money on dental visits and procedures. The WP-660 is one of the best water flossers made by Waterpik. It's an ADA-accepted flosser that was the first one to be given that honor by the American Dental Association. There are 10 pressure settings that will deliver 90 seconds of water flossing. 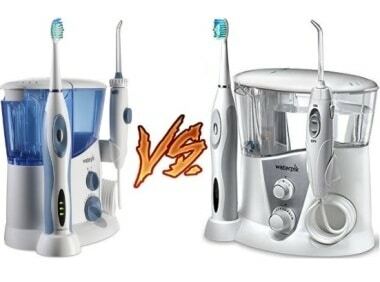 There's much to love about both these water flossers, but the WP-660 has a few more things going for it than the WP-100. They both deliver 90 seconds of flossing with their large reservoirs. Each reservoir has a cover that will keep the water sanitary inside. There's also a storage space for holding the tips when they're not in use. The Aquarius 660 has one more water flossing tip than the 100. Instead of just 2 Classic tips, there are 3 Classic tips with the 660. It can be used as an extra replacement tip, or can be used by another member of your family. The WP-100 delivers 10 to 90 PSI based on the 10 power settings available. The WP-660 delivers 10 to 100 PSI. That's more power for the same amount of settings. That doesn't necessarily make the 660 a better flosser. It'll depend on how much power you can take in your flosser. Beginners and those with sensitive teeth might not want that much power at all. The WP-660 has a Hydro-Pulse Massage Mode as well as LED indicators. The massage mode brings increased circulation to a person's gums. That can relieve all kinds of problems like gingivitis and gum sensitivity. The WP-100 doesn't have a massage mode. 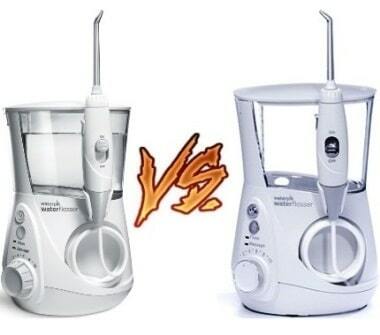 You'll need to decide for yourself which is the best choice for flossers between the 100 and the 660. It'll depend on your budget, sensitivity needs, and massage requirements. There are subtle differences in the 660 versus the 670. They're both great flossers with features that will give you an incredibly clean mouth. The pressure settings will ensure that you can pick water pressure that works based on your gums and teeth. Some people are more sensitive than others. You can start out with a lower setting until your mouth becomes accustomed to the higher pressures. It'll give everyone in the family a chance to pick their own personalized settings. They both range from 10 to 100 PSI. The water tanks for each model flosser are considered a medium size. They hold over 90 seconds of water. This is an important stat because that's how long you can floss before you need to refill the reservoir. Dentists recommend at least 90 seconds of flossing after meals and before bed. The WP-660 and WP-670 both have floss and massage modes. You can change between floss and massage as well as the pressure modes to have a truly personalized flossing experience. There's a pause button on the handle that will allow you to stop the water flow while you make adjustments, too. Both flossers have an impressive reservoir capacity and 10 pressure settings. They also both have a timer and pacer. The timer will ensure that you're spending the recommended amount of time with your flossing routine. The pacer will time you to ensure you spend 30 seconds on each area of your mouth. You'll get 7 flossing tips with each model. There will be 3 Classic Jet tips, a Toothbrush, Plaque Seeker, Orthodontic, and Pik Pocket tip. Each of those tips are held in a storage portion attached to the reservoir. The WP-670 has an extra storage case that isn't attached, too. Another difference between the 660 and the 670 is cosmetic. The 670 is available in more colors. While the 660 comes in white, black, and blue, the 670 has pink and teal available as options. If you're trying to make oral hygiene more fun, the pink or teal is a good choice. The last two comparisons we'll go over are the WP-900 and the WP-950. These water flossers come with flossers as well as sonic toothbrushes. They're in the upper end of the spectrum when it comes to price. This is understandable since they are a 2-in-1 product that provides more features and benefits. The Sensonic comes with the flosser. It's a sonic toothbrush that alleviates the need for you to have two devices on your bathroom counter. The WP-900 comes with 2 extra brush heads while the WP-950 comes with 4 extras. If you have an entire family who will be sharing this device, the extra brush heads will come in handy. The heads can be stored next to the spacious reservoir. The WP-900 comes with 2 Classic Jet, 1 Plaque Seeker, an Orthodontic, and a Pik Pocket tip. It also comes with one standard and one compact brush head. The standard is for normal cleaning while the compact head is for precision brushing. The WP-950 has the same amount of flossing tips, but there are two extra brush heads. There are 2 standard and 2 compact heads included. Each reservoir has the capacity for 90 seconds of flossing. That's the dentist recommended amount of time that a person should be flossing. It'll remove more plaque and food below the gum line as well as from between teeth. The 950 claims to have a space-saving design versus what's available in the 900. It's smaller and lighter with the same amount of reservoir space. It's 2.45 pounds compared to the 3.2 pounds of the 900. That does make it a slimmer and lighter design. When it comes to differences, the 950 gives customers a portable storage case for the attachments. They both have a travel case for the toothbrush, but only the WP-950 allows you to store the tips outside of the reservoir. There is also a Hydro-Pulse Massage Mode in the 950 that isn't available in the WP-900. You'll be able to massage your gums and increase circulation with the WP-950, which is a great feature if you have a problem with sensitive gums that are sore. 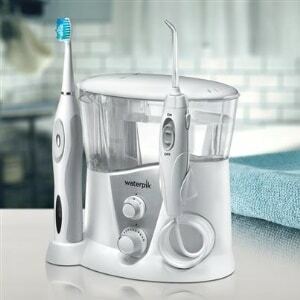 The WP-950 is also a sleeker version of the water flosser with sonic toothbrush. It has silver accents and slimmer buttons. Overall, the choices you make between the WP-100, the WP-660, WP-670, the WP-900, and the WP-950 will depend on your personal needs. That can be determined by talking to your dentist. Beginners who are unsure about taking on a water flosser can get incredible benefits by starting out with the WP-100. 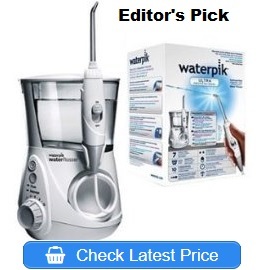 The WP-950 is at the top of the spectrum and has some of the best features of Waterpik's advanced technology. If you're not a beginner to the world of flossers, it makes sense to get a flosser and sonic toothbrush like the WP-950. There are incredible benefits and the best features available from the company. 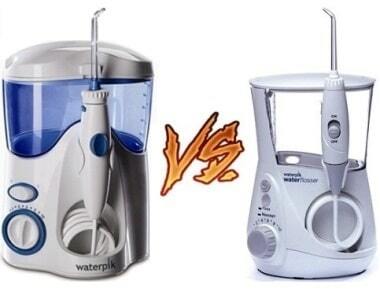 Waterpik Aquarius vs Ultra: Who Has the Best Features? Hydrogen Peroxide Teeth Whitening Home Remedy: Does It Work?